Itemization: What tools in this suite are competitive? Do these picks synergize with each other? Is there anything in the pool without available counters and should it be banned? Which of these choices best suits the map we are playing on? Analytical: What are the strengths and weaknesses of my fireteam? Do these picks play to these strengths? Can we ban out or deny-pick all of our core weaknesses? How should we adjust our playstyle to the tools at hand? Play to the strengths of Destiny’s combat sandbox – core asymmetry that requires strong game sense and knowledge of how each weapon archetype requires its user to play in order to maximize effectiveness. After Alpha Ban 1, swaps to Bravo Ban 1, then repeats for 2nd and 3rd ban rounds. Repeat for Energy, Power toolboxes. Expectation is that strong teams will not utilize full amount of pick and ban time and will instead rapidly identify choices. Introduction for match must include selected subclass per character (or players must select subclass and tree before weapon pick/ban in separate custom GUI layer); players can make analytical choices of expected desired loadouts of other players based on this. Strong teams may ban more sidearms, swords, and other shock-and-awe close-range choices against a team of Nightstalkers, for example. 30 second assignment phase – players choose from their team’s picked items to build their loadout. High potential for social friction between teams if picks are not evenly rounded (this is a positive thing). If choices are not made, selections are randomly assigned to players. Total Maximum Pre-Match Time: 8 minutes 30 seconds. Risk: Pre-match setup time is at odds with current matchmaking time commitment goals. Total match time could be reduced by making win condition best of 5. However, the match time vs. setup time feels lopsided – more setup than actual play. Toolbox: 16 pre-built loadouts, 1 weapon per slot (Kinetic, Energy, Power); 8 loadouts picked, 6 loadouts banned (14/16 loadouts engaged per match). Each loadout should be named and must be hand-crafted by Crucible designers. This removes the risk of randomized loadouts with no synergy, and supports player conversations outside of the match (“Wow, next time you see the Hail of Lead loadout just insta-lock it, it’s so strong right now.”). 60 second Planning Phase to assess pool – while complexity of picking phase has been reduced, there are more high-level decisions to make about player’s style of engagement and overall team strategy so planning phase should remain at initial length. Again, expectation is that strong teams will not utilize full pick and ban times and will be able to instinctively identify strong loadouts. This capitalized on a core strength of Destiny – the emotional response to thumbnail icons of weapons that are strongly preferred or disliked by individual players. Recommended that subclass selection occurs before weapon banning (visible in planning phase) if not locked at time of activity matchmaking. 30 second assignment phase – players choose from their team’s selected loadouts. Slightly lower potential for social friction as generally players will be able to identify at least one item in a given loadout that they find agreeable vs. one player potentially taking the lion’s share of top-tier meta weapons in the granular single-item-pick version of the mode. Risks: Pre-match time is significantly lower but audience tolerance for menu work is untested. It is possible that not enough time is being given for picking given the reduced time. 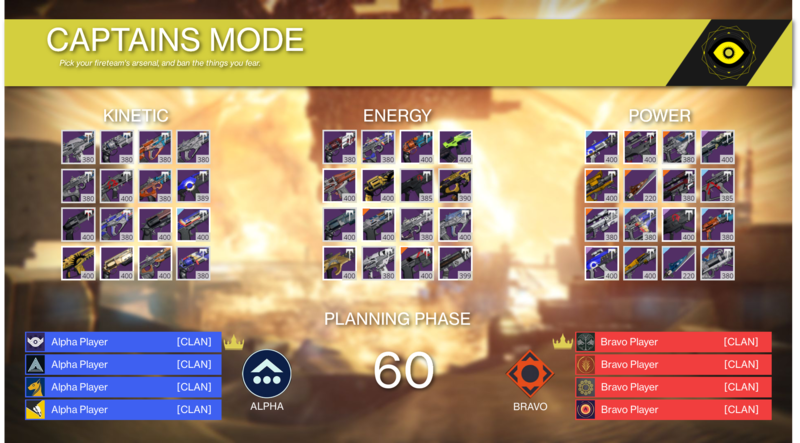 Loadout quality is subject to identification ability of Crucible team responsible. Overall assessment: Finding the balance of time per phase is extremely important and should be tuned heavily based on data and feedback. It is unclear if audience will tolerate any length of setup given response to Trials pre-match introduction scenes, though pick/ban is more actively engaging and may alleviate the issue. Additional risk is that bans are, by virtue of being first in the order, extremely potent and may be too powerful with many non-meta loadouts. Players may find enjoyment in working with unusual sets of tools, but also may reach points of frustration. Curation of loadouts to reduce this possibility is of extreme importance, but must not result in flat and over-similar choices. Mentioned but not visualized here is the possibility of a subclass selection UI. 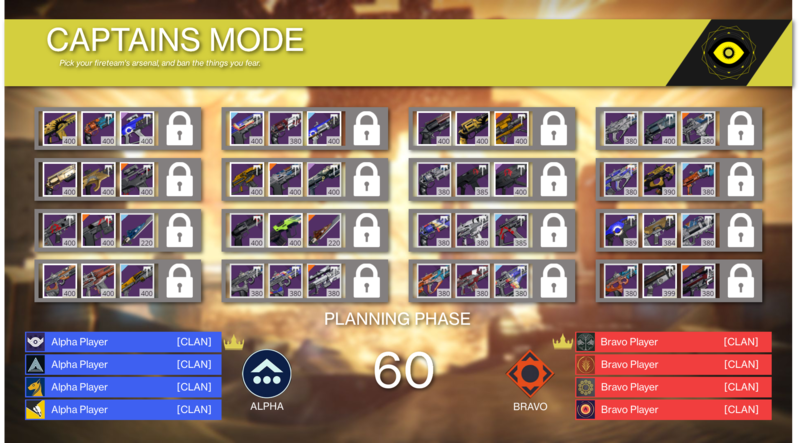 This could be an additional 30 or 60 second phase ahead of the planning phase where players select their subclass/grenade/ability tree/class ability. This could be displayed briefly to players as we enter the planning phase. However, this adds more time to the setup time and may not be desirable. As a whole, while I would like to include class-specific atoms to the banning process, it is so important to keep players’ attentions and not drag out the setup time that it may not be possible.